I have a 24" above ground pool. It is setup on concrete which is not level. What can I put under the pool legs that will not hurt the liner in order to help level it? Please help - my kids are driving me crazy. Hi Teresa Of course there is nothing specifically made for this purpose but I do have some ideas. We used to set up display pools on a very unlevel parking lot. We used a lot of roofing shingles and a lot of sand. The shingles work well as they can be stacked in such a way as to make the rise and fall gradual. Extra sand is needed to level the concrete under the liner. It is nearly impossible to install a smooth liner if the ground under the liner is not level. When all the water goes to one side before the other wrinkles develop. 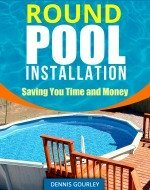 We would try to keep the inside of the pool as level as possible and this helps with the liner installation. When raising areas over 1 1/2" 2x4 lumber works great. Using the lumber with the shingles will save on the cost of shingles.